Looking for that perfect Fall Fudge recipe? 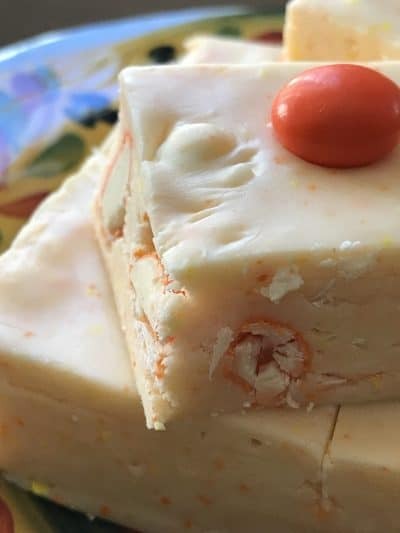 Than look no further, this recipe for White Chocolate Candy Corn Fudge is exactly what your looking for. Don’t like candy corn? 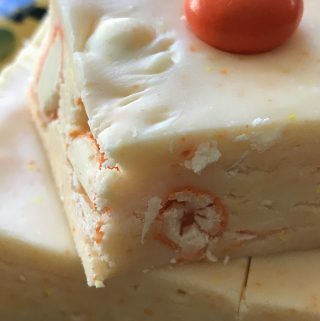 No problem, this fudge isn’t made with candy corn. It’s made with M & M’s Candy Corn Flavored Candies, and everyone loves m & m’s candy. 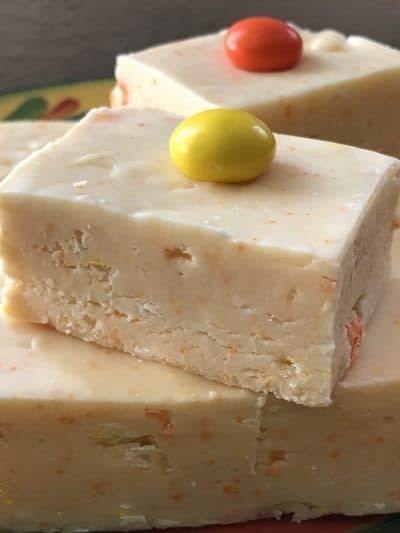 White Chocolate Candy Corn Fudge is packed full of m & m’s candy corn flavored candy, an 8 oz bag full. Some of the candies are chopped in a mini chopper, while some candies are left whole. They get stirred into the fudge mixture right before pouring into an 8 x 8 -inch buttered pan. This recipe is the same recipe I use for all of the fudge I make. As they say, “If it ain’t broke, don’t fix it!” meaning it turns out every single time. The recipe I use makes an 8 x 8 -inch pan, making experimenting with flavor combinations a lot more fun and daring. If a flavor combination doesn’t work out, it’s not a huge 13 x 9-inch pan disaster. If I don’t care for the taste of the flavor combination, off to work with my husband it goes (I swear they eat anything there) and most importantly, if I do like the flavor combination, eating half of an 8 x 8-inch pan of fudge isn’t soo bad! This recipe isn't made with actual candy corn candy. It's made with M & M's Candy Corn Flavored candy. Easy and melt-in-your mouth delicious! Line an 8 x 8-inch square pan with heavy duty foil. Grease foil with 1/2 tablespoon butter. Set pan aside. Measure 1/2 cup whole M & M's candy, set aside. Chop remaining M & M candies in a mini chopper or food processor until coarsely chopped. Set aside. Combine remaining 2 tablespoons butter, evaporated milk, sugar and salt in medium, heavy-duty saucepan. Bring to a full-rolling boil over medium heat, stirring constantly, for 4 to 5 minutes.Remove from heat. Stir in mini marshmallows, white chocolate chips, chopped M & M candies and vanilla extract. Stir vigorously for 1-minute or until marshmallows are completely melted. Stir in whole M & M candies and pour into prepared pan; refrigerate for 2 hours or until firm.Cut into 48 squares, decorated with M & M's candies, candy corn or miniature candy pumpkins.